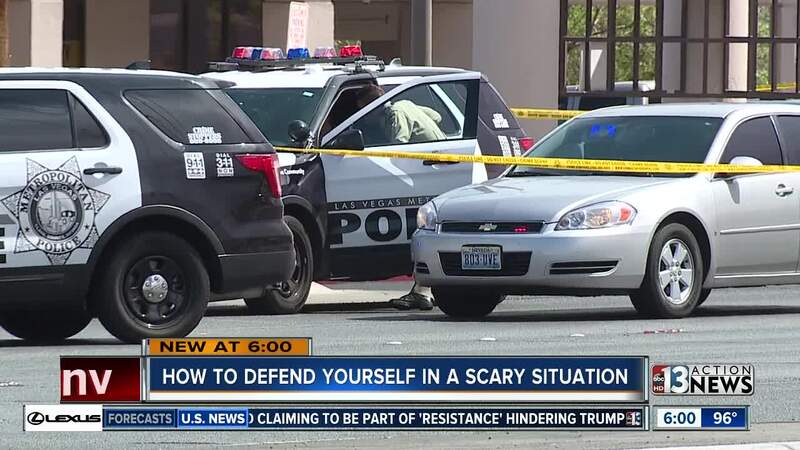 Two recent scary incidents involving women prompted 13 Action News to look at self-defense tips for women. The first incident was a hostage situation involving a female employee at Pawn Star near Rainbow and Charleston. Police say the woman was able to knock a gun out of the suspect's hands and break free. The second incident was an alleged sexual assault near Casino Center and Oakey. Police say a man only identified by a sketch forced a women into his car at gunpoint, sexually assaulted her, punched her in the face, and then shoved her out of the vehicle. We talked to Patti Stewart, owner of Defense in Heels, about things women can do to protect themselves in situations like these. Stewart says reported statistics show one in five women are assaulted in their lifetime. Stewart says most assaults go unreported and the statistic is more like one in two women are assaulted in their lifetime. Stewart focuses her classes on women and children self-defense. She says the biggest difference in self defense for men and women is men use their upper body strength and women must use their hips. "For women, all power and control is based on your hips and as long as you know how to manipulate your hips properly, you can get out of any situation you are put in," said Stewart. She emphasizes the importance of all women needing to know basic self-defense. "Self-defense is 90 percent awareness," she said. "That's just paying attention to your surroundings and what's going on. The average bad guy will target in on his victim within seven seconds of spotting them." She says all women should take at least two classes a year because muscle memory is not very good and muscles will forget the self-defense moves we learned every few months.